Antonio Guterres today warned against an abrupt cut to US funding for the UN, saying it will affect the world body's long-term reform efforts. UNITED NATIONS: Secretary-General Antonio Guterres today warned against an abrupt cut to US funding for the UN, saying it will affect the world body's long-term reform efforts. Guterres's comments came after US President Donald Trump proposed a budget cut for diplomacy and foreign aid. Guterres's spokesperson Stephane Dujarric told reporters here yesterday the UN Chief has seen the blueprint of the 2018 budget released by the White House and stands ready to discuss with the US and any other Member State how best to create a more cost-effective Organisation to pursue shared goals and values. "Abrupt funding cuts can force the adoption of ad hoc measures that will undermine the impact of longer-term reform efforts," Dujarric said. Trump unveiled a 1.1 trillion dollar budget that proposes cutting foreign aid by 28 per cent. Military spending would increase by USD 54 billion, a 10 per cent rise, in 2018, in addition to a USD 30 billion increase in the current year. 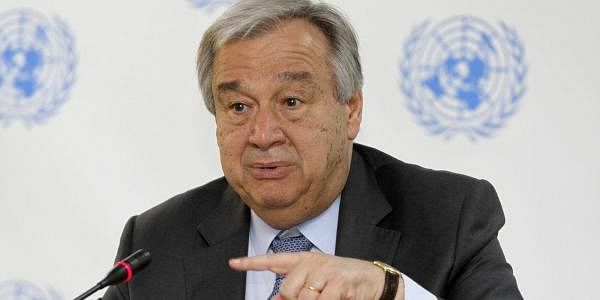 Guterres also added that increasing military spending alone will not be enough to combat terrorism and countries will have to address the underlying reasons behind terrorism by investing in conflict resolution and countering violent extremism. "The Secretary-General fully subscribes to the necessity to effectively combat terrorism, but believes that it requires more than military spending," Dujarric said. "There is also a need to address the underlying drivers of terrorism through continuing investments in conflict prevention, conflict resolution, countering violent extremism, peacekeeping, peacebuilding, sustainable and inclusive development, enhancement and respect for human rights, and timely responses to humanitarian crises," Dujarric said. The United States is the biggest contributor to the United Nations, paying 22 per cent of the USD 5.4 billion core budget and 28.5 per cent of the USD 7.9 billion peacekeeping budget. Last year, Under-Secretary-General for Management Yukio Takasu had said the US owes the UN USD 1.3 billion for peacekeeping and USD 917 million towards the regular budget. US Ambassador to UN Nikki Haley said in a statement that in many areas, the UN spends "more money than it should" and in many ways it places a much larger financial burden on the United States than on other countries. She said she will work with Members of the US Congress to craft a budget that advances US interests at the UN while working with her UN colleagues to make the organisation more effective and efficient. Rights group Human Rights Watch however expressed concern over the US government's proposed reduction in funding for UN peacekeeping and unspecified cuts for the rest of the UN, saying it sends a "disturbing message" about the Trump administration’s commitment to human rights at a global level. "While it is appropriate for the US to seek UN reforms, deep funding cuts would threaten UN institutions and programs that advance and promote human rights worldwide," UN Director at Human Rights Watch Louis Charbonneau said.